Bill was inducted into the AHL Hall of Fame in 2010. 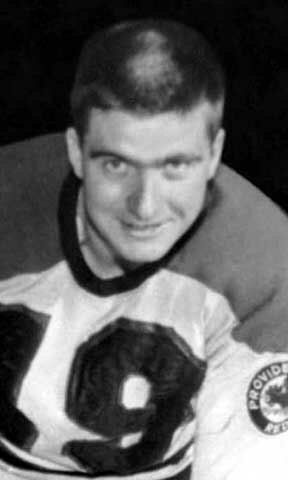 Like Bruce Cline the year before, Bill Sweeney burst upon the American Hockey League scene with the Reds in 1957-58 and won the Dudley “Red” Garrett Award as the AHL’s outstanding rookie with 31 goals and 46 assists in 70 games. It was his one and only season wearing the Reds’ colors. Over the course of 12 seasons in the American Hockey League, Sweeney was one of the most dangerous offensive weapons in the sport, primarily as the offensive catalyst of the three-time Calder Cup champion Springfield Indians. One of the AHL’s all-time elite scorers, he led the league in scoring for 3 consecutive seasons, an unprecedented and yet unmatched league record. Over his career, he hit the century mark in scoring 3 times and the 40-goal plateau twice. His 155 goals and 408 points from 1959-63, combined with the troikas of scoring crowns and Calder Cups, two First Team All-Star berths and a Second Team nod, represent the most productive four-year span by any player in AHL history.